In our ongoing "Privacy Solutions Series" we have been outlining various user-empowerment or user "self-help" tools that allow Internet users to better protect their privacy online. These tools and methods form an important part of a layered approach that we believe offers a more effective alternative to government-mandated regulation of online privacy. [See entries 1, 2, 3, 4] In this installment, we will be exploring CCleaner, a free Windows-based tool created by UK-based software developer Piriform that scrubs you computer's hard drive and cleans its registry. We'll describe how CCleaner helps you destroy data and protect your private information. Whenever you move files to the recycling bin and subsequently purge the recycling bin, the affected files remain on your computer. In other words, deleting files from the recycling bin does not remove them from the computer. The reason for this is important and, in many ways, beneficial. In some respects, many computer file systems work like an old library catalog system. A file is like a catalog card and contains the reference to the actual place on the hard drive where the information contained in the file is stored. When a user deletes a file, the computer does not actually clean all the affected hard drive space. Instead, to extend the analogy, the computer simply removes the card catalog entry that points to the hard drive space where the file is contained and frees up this space for new files. The reason this is usually beneficial is that cleaning the hard drive space occupied by a file can take a while. If you want evidence of this, look no further than the length of time required to reformat a hard drive (reformatting a hard drive actually clears the disk's contents). The practical implication of the way hard drives work is that when you delete an important memo from your computer, it is not actually gone. Similarly, when you clear your browsing history, it is not gone. The bottom line is that an individual who can access your hard drive (a thief, the government, etc.) could view many or all of the files you deleted. CCleaner enables you to select a host of potentially sensitive files (e.g., recycling bin, browser history, memory dumps, and cookies) and definitively delete them by writing over them at the root of the file system. In particular, CCleaner enables the user to choose whether files should be entirely overwritten once, thrice (DOD 5220.22-M standard), seven times (NSA standard), or 37 times (Gutmann standard). The end result of this is that users can entirely remove a file from their machines. 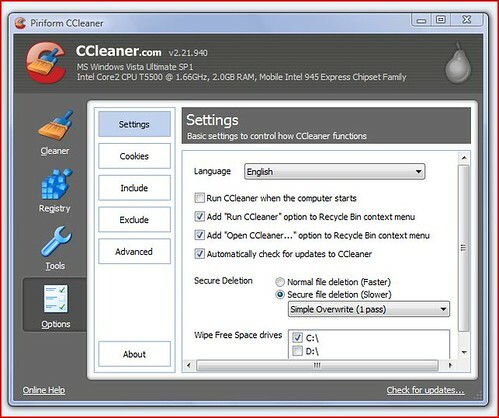 As an added benefit, CCleaner also allows users to delete files that may not be sensitive in nature, but are not necessary for everyday computer tasks and as a result, their continued presence slows down the computer. The best part of CCleaner is that it is free, stable, safe, and extremely easy to use. It has won numerous awards and, according to the CCleaner website, the tool has been downloaded an astounding 300 million times. To download CCLeaner, visit http://www.ccleaner.com or http://download.cnet.com/ccleaner. More information about CCleaner is embedded down below, including a couple of YouTube videos. The most important tip to using CCleaner is ensuring that all files that are deleted from the recycling bin are subsequently overwritten (and therefore cannot be uncovered by someone who later accesses your hard drive). This feature is not enable by default. To turn it on, do the following: (1) Open CCleaner (2) Click on "Options" from the bar on the left hand side of the program. (3) Click on "Settings". (4) Click on "Secure file deletion (Slower)". The adjoining exhibit shows what that screen looks like.